My Pictures is the name of a special folder on Windows systems to store a user's digital pictures and of course other files, too. Other special folders include My Documents, My Videos, My Music, etc. 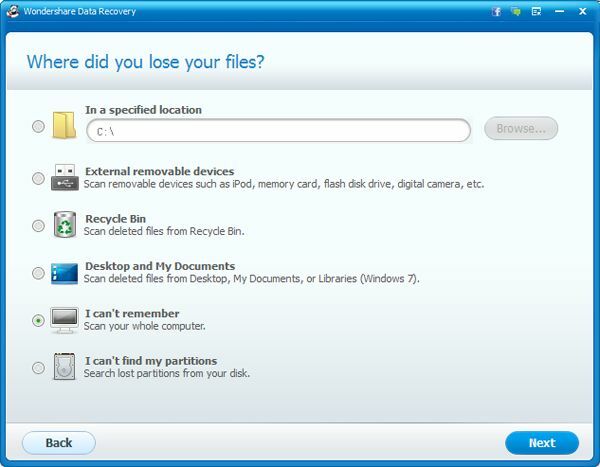 So if you deleted the My Pictures folder and can't restore it from Recycle Bin, you may be thinking: is there any way to recover deleted photos from My Picture folder? Yes. With the help of data recovery software, you can get back all precious photos included in My Pictures folder. As for the best oen to this, WS Data Recovery is what you want. It provides various ways to help you restore digital photos in the original quality. All image file formats are supported, including but not limited to JPG, PNG, BMP, GIF, TIF, RAW, PSD, CRW, CR2, NEF, ORF, MRW, DCR , RAF, SR2, WMF, DNG, ERF, and so on. Important: To prevent permanently deleted photo in My Pictures folder, please install the software to a removable hard drive. Now follow the easy steps to restore all photos in My Pictures folder with the recommended photo recovery software. 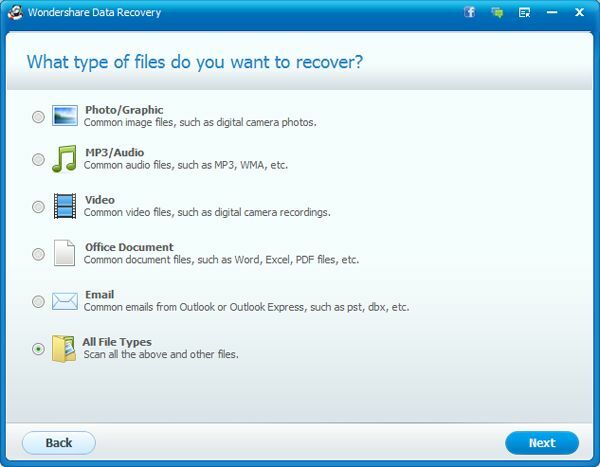 Start Wondershare Data Recovery and you'll enter the Wizard mode which allows you to recover deleted files by answering questions. For the first question, choose Photo/Graphic to recover photo files from My Pictures folder, or select All File Types if you want to recover music, video or email files. Click Next to continue. 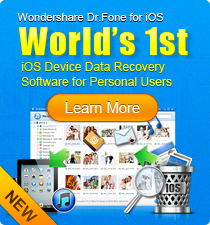 This data recovery software lets you recover deleted files from frequently used places easily. You can also specify any folder on your computer. Here you can either choose Desktop and My Documents in the "Where did you lose your files" window, or specify the path to My Pictures folder. See below for the My Pictures folder default path in versions of Windows system. When scanning is over, all picture files deleted from your My Pictures folder will be organized in a clear folder tree. Locate the photos you want to recover and check the checkbox before clicking the Recover button. You can also type a keyword to find desired photos quickly. Tips: As you can see, you can also digital photos by file type. Just switch to File Type tab on top first. Q: I accidentally deleted "My Pictures" folder. Is there any way to get back the folder? A: This article show you how to create a new shell Pictures folder: http://www.vistax64.com/tutorials/90705-personal-user-shell-folders.html. DO note that this will not recover the deleted photos. This just gets you back where you were in terms of using the My Pictures folder. 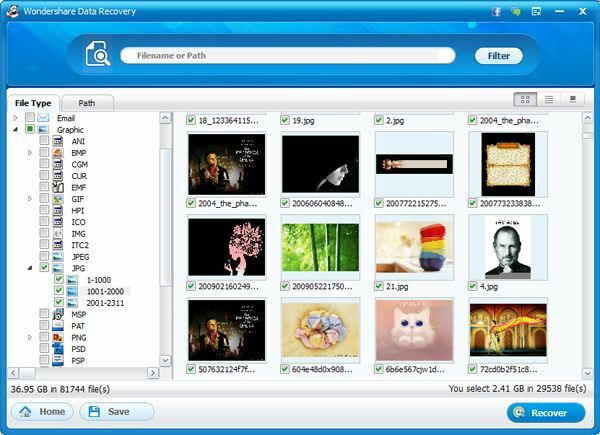 Download this picture recovery software now and follow the video tutorial below to retrieve digital photos deleted from My Pictures folder in Windows. The Mac version is also available. Also use it to restore digital photos on Mac.